Corey, 16, has been apart of the JPD Camps for Wheelchair Basketball as well as competing in the Classic for QLD Juniors, is a part of the Frenchville Rockwheelers Team competing in the Northern Challenge and was a part of the team that competed in the Sunshine Coast Spinners tournament. Corey was born premature with VSD and Cerebral Palsy Spastic Diplegia and took up wheelchair basketball when he started going to NO LIMITS in Rockhampton and saw some guys doing basketball. He had a try and loved it and has been playing every since. Corey has been apart of the JPD Camps for Wheelchair Basketball as well as competing in the Classic for QLD Juniors and is a part of the Frenchville Rockwheelers Team competing in the Northern Challenge and was a part of the team that competed in the Sunshine Coast Spinners tournament. To keep up his fitness, Corey trains three times a week in Rockhampton and attends gym sessions twice a weeks to keep up his strength. 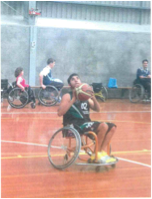 His ultimate sporting goal is to make the Australian Wheelchair Basketbnall team as a low pointer and although his knows it’s a lot of hard work he is up for the challenge. Corey’s greatest sporting achievement was making the QLD Juniors Squad for Wheelchair Basketball and getting Junior Athlete of the year, 3 years in a row in Rockhampton.